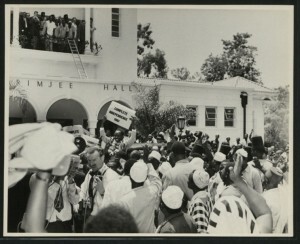 Cover for TA 101 shows Prime Minister Julius Nyerere leaving Karimjee Hall in Dec 1961. Big Gold – Thankyou & Goodbye ? 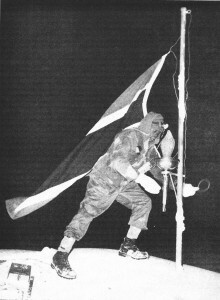 ‘Climaxing a feat which caught the imagination of the world, Lieutenant Alexander Nyirenda climbed to the summit of the mighty Mount Kilimanjaro and lit a symbolic torch next to the new Tanganyikan flag. 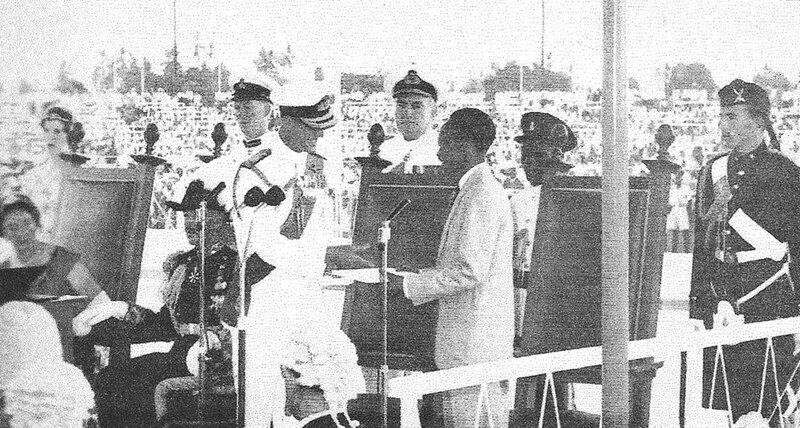 The scene at the Independence ceremony in the National Stadium as the Duke of Edinburgh handed over to Prime Minister Julius K Nyerere the Constitutional Instruments which formally granted independence. 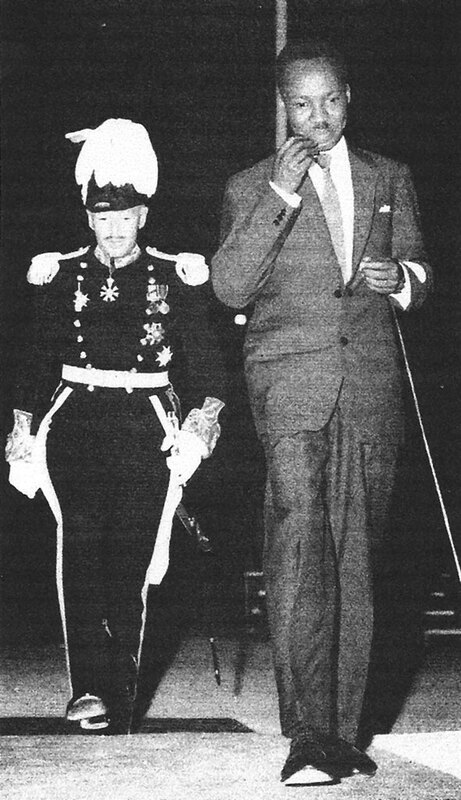 Prime Minster Julius Nyerere leads the Governor, Sir Richard Turnbull back to the Royal Box after the raising of the new flag. Many thanks Jim Watson for making available to us this publication with its excellent photos dating back to 1961 – Editor. 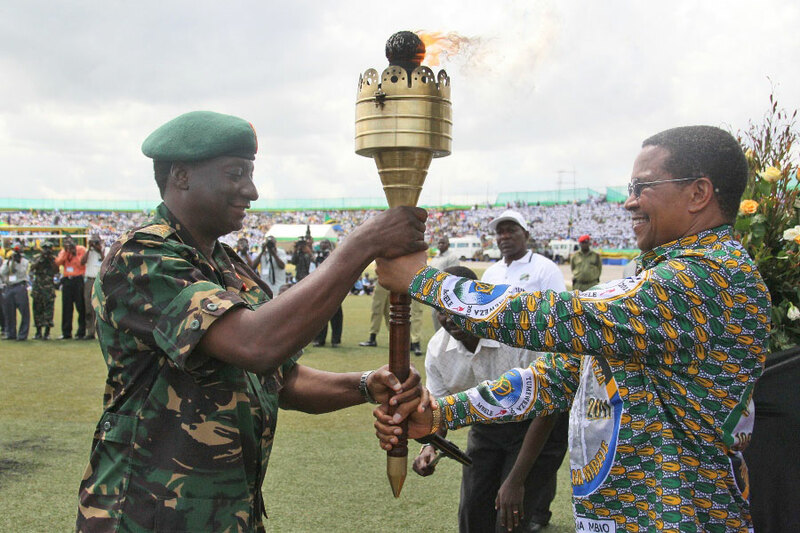 President Jakaya Kikwete hands over the Uhuru Torch (mwenge) to the Chief of Defence Forces, General Davis Mwamunyange, at the end of the countrywide Torch race in Dar es Salaam. 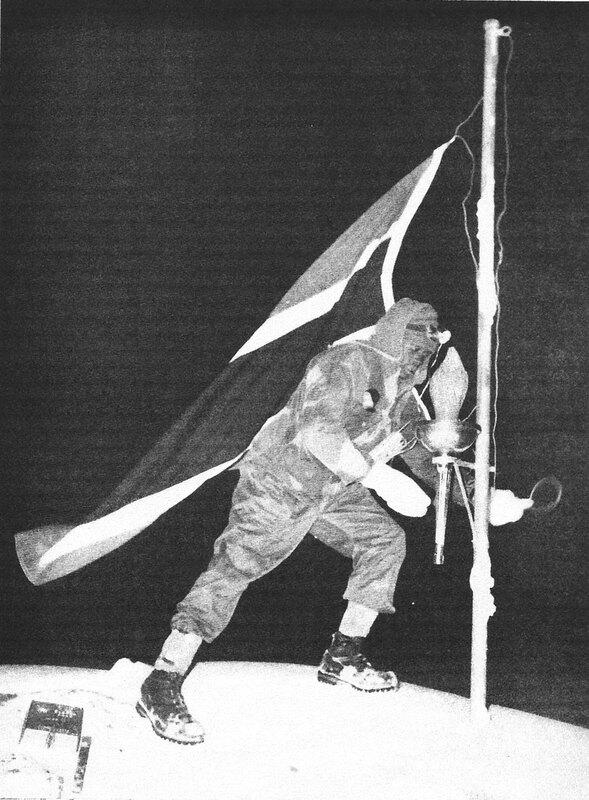 Gen Mwamunyange later presented the Torch to a team that took it to the peak of Mount Kilimanjaro. 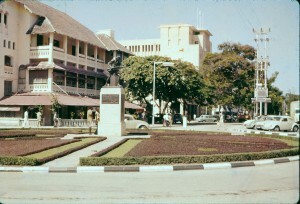 Photo – State House. In Dar es Salaam, the celebrations started in earnest in July. Ministries took turns to showcase their activities at the Mnazi Mmoja grounds. Then on 9th December, over 40 Heads of State, Government and other dignitaries attended the main celebrations which included a guard of honour by the country’s armed forces and a 21-gun salute to the Commander-in-Chief. There was a display of the army’s equipment ranging from tanks, armoured vehicles to trucks and other vehicles used in warfare. A number of fighter jets were flown in synchronized formations over the stadium. Some 4,500 children from primary and secondary schools entertained guests with a mass performance followed by traditional dances by four different traditional groups, hand-picked to proportionally represent Tanzania. The dances included Selo from Coast Region, Ngongoti from Mtwara Region as well as Msewe and Bugobogobo from Zanzibar and Mwanza respectively. The colonial government, he explained, had no intention of developing the country but just wanted to exploit its resources. 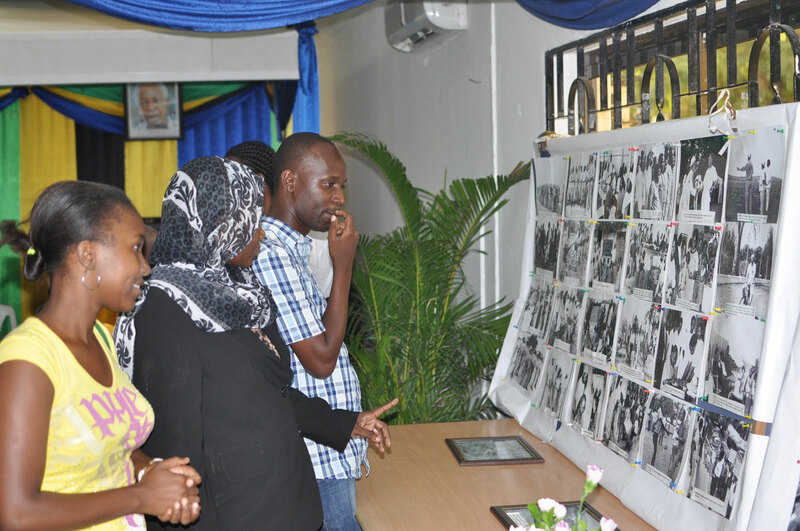 “But Mwalimu Julius Nyerere and his colleagues vowed to fight for our independence and help Tanzanians climb out of abject poverty.” The President also pointed out that many big challenges lay ahead. Queen Elizabeth II congratulated Tanzania on the 50th independence anniversary. She wrote that the 50 years had been characterized by peace and stability, a rare thing to find in many other parts of the world. “It gives me great pleasure in sending your Excellency and the people of Tanzania my warmest congratulations on this very special occasion,” she said. Fifty years ago HRH the Duke of Edinburgh, representing the Queen, was in Dar es Salaam at the ceremonies connected with the handing over of power from Britain to the new country, then known as Tanganyika. Fifty years later in November 2011 his son Prince Charles was in Dar es Salaam to join in the 50th anniversary of those momentous events. Tanzania tightened security to guarantee the safety of 14 foreign Heads of State and Government who came to mark Tanzania Mainland’s 50 years of independence. Prime Minister Mizengo Pinda, said the government had upped the security profile as a precaution against threats from the Somalia-based Al Shabaab terror group. Many people complained about the cost of the celebrations in view of Tanzania’s shortage of funds for all kinds of development projects. According to the Citizen the government spent a total of TShs 64 billion to facilitate the celebrations. Some TShs 8 billion was allocated to local governments. Regional administrations and local government authorities organised celebrations in all of the mainland’s 21 regions, and 136 district councils. Major items of expenditure included preparatory logistics, fuel, per diems for civil servants and printing costs for leaflets highlighting achievements that respective districts and regions had registered over the 50-year period. 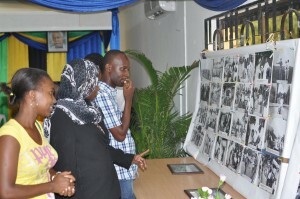 About TShs 213 million was given to Tanzania Trade Development Authority to finance ministerial exhibitions as well as those of state agencies and the private sector, at the Mwalimu Nyerere exhibition grounds along Kilwa Road in Dar es Salaam. The Ministry of Industries, Trade and Marketing reportedly received TShs 30million. Each of the nearly 5,000 youngsters who participated in the mass display was reportedly paid TShs 40,000 (£16). Ubungo MP John Mnyika (Chadema) said the money should have been channelled into development projects. The Uhuru anniversary would have been more memorable if the money had been spent on settling teachers’ debts, as well as those of other public employees. “We could also have spent the money on building feeder roads in Dar es Salaam, to ease congestion on the few major roads… people would have remembered that for a long time,” he said. 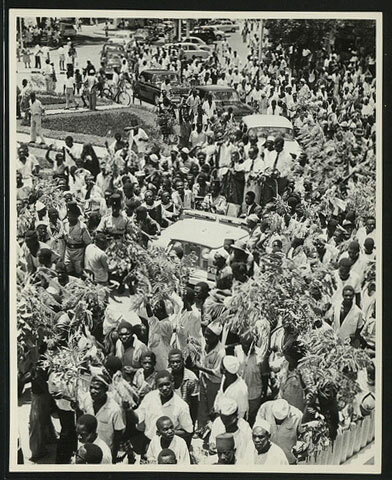 Nyerere: … In 1961, what was our major ambition? Our major ambition was obviously to survive as a nation. We have survived as a nation, we have consolidated ourselves as a nation, and we have consolidated our independence. I suppose really, quite frankly, this is our biggest achievement. Only as an independent country could we do such things as raising standards of living, increasing education, and so forth. Well I can’t say we have achieved all we would have liked to achieve. Questioner: You place a very heavy emphasis on rural development… but in this report, you say, “indeed more money has in fact been spent on urban developments, industrial and business development, than on rural areas, in this post-Arusha period”. So what could, in your opinion be the reason for that? Q: What are your reservations about foreign development corporations? N: I think reservations would be quite normal. Quite normal. It is always a matter of judgment what country we are dealing with. Very often rich countries use their ability to assist poorer countries in order to dominate these poorer countries, to build spheres of influence, to keep other competitors, other nations out. And they regard them as competitors. A kind of jealousy develops. I want to build a railway, and I try to get some money from the Western world; if I don’t get that money then I try to get it from China. The fellows do not want to give the money, and then they ask why? why? This is introducing the Chinese to Tanzania. There is kind of feeling… keep the Chinese out, Tanzania is our sphere of influence. You know the Chinese should be kept out. It becomes a kind of instrument. Aid becomes an instrument of imperialism. And this is really the first reservation. Secondly, aid should help us to do what we want to do. It’s no use some country coming here with some brilliant idea that they want to do xyz. And in our own priorities we don’t want to do xyz, it is something that can wait until the 2000s. Q: Do you see anything remarkable in the Chinese assistance causing any changes in the non-alignment policy? N: I don’t see why it should. Non-alignment has never meant that a non-aligned country should have nothing to do with an aligned country. This has never been a definition of non-alignment. It has the meaning that we must never behave in our relations with aligned powers as if we belonged to their blocs. We don’t. And we have relations with China just as we have relations with the Soviet Union or relations with the United States. We see no reason why it should affect our nonalignment. Actually we feel it is an expression of our non-alignment. We would find it ridiculous that it is not alright for us as a non-aligned country to ask the Soviet Union or the United States to build a railway for us. But somehow it becomes wrong for our non-alignment if we ask China to build a railway for us (laughter). Q: Your views of the present dispute between Tanzania and Uganda amidst reports of border clashes. Do you think there will be a danger of war? N: Well, what you really want one never knows. I mean it takes two, to bring about war. But actually it doesn’t take two, it can take only one. So in that sense, if one side decides to be foolish, this foolishness can lead to a dangerous situation. But frankly, I don’t believe that these troubles on the border can cause, can be developed into anything more than troubles on the border. Q: What is your comment on the British Foreign Secretary Sir Douglas Home going to Salisbury trying to negotiate a settlement to the Rhodesia problem. N: Our views have been very clear for years and they’ve not changed. It was Sir Alec, when he was Prime Minister of Britain, who formulated the so-called five principles. And it was while he was Prime Minister that we said we don’t accept these principles as a basis of granting independence to Rhodesia, because they mean granting independence to a country on the basis of minority rule. And we don’t accept this. And it is really this which he’s going to negotiate with the Rhodesians. He’s going to negotiate with the White Minority there. To hand over to them the government, the same thing that they did in South Africa. They want to create a second South Africa. This is really the whole basis of these talks, to create a second South Africa, and we’ve always said we can’t accept this. What are we expected to say? ‘This is fine’? Q: Is there any settlement which you would not consider to be a sellout? N: Any settlement. Any settlement on that basis would be a sell-out. Handing over five million people to the good will of a tiny minority, and believing that this minority at some future date will hand over power to the majority. It doesn’t happen. Q: You said in September this year in this report, Tanzania has paid a heavy price in economic aid for her stand on these matters. But neither in relation to Britain nor any other country have we wavered on the policies we believe to be right because of our desire to develop our country at maximum speed. Have you ever doubted? N: Have I ever doubted our policy? Never. Q: But you have paid a price? N: Well surely you must pay a price for your freedom, if it is really freedom. If we wanted to remain a colony we could have remained a colony. As a colony our responsibilities wouldn’t hold. I got my grey hair in our second year of independence. My hair was black, completely black when we became independent, and in two years it had gone grey, because of some of the problems of independence. If you don’t want the problems of independence don’t become independent. Q: Do you think that the freedom fighters will succeed? N: Why not? If we didn’t believe they will succeed then there is no point in fighting is there? There’s no point in the struggle is there? Unless it is a kind of religion. There’s no point in struggling for freedom unless you believe you are going to win. And if we believed these people are wasting their time, why should we be working to get support for them throughout the world. We are trying to get the world to understand this problem in southern Africa, and to understand that these people are struggling for human rights, and they must be helped until they win. If we didn’t believe they have a chance of winning there is no use helping them, or trying to get their world to help them. Q: Now this is the last final question. Mr. Karalov has suggested that you have been translating William Shakespeare into Swahili. Have you yourself been writing any poems? N: No. Not poems in that sense, not poems in that sense of William Shakespeare. Everybody. Every literate person has written some verse. So that’s all. This question of Shakespeare is really you have read Shakespeare, so have I. Some. I have not read Shakespeare, I have read one or two books, not more than one or two books. 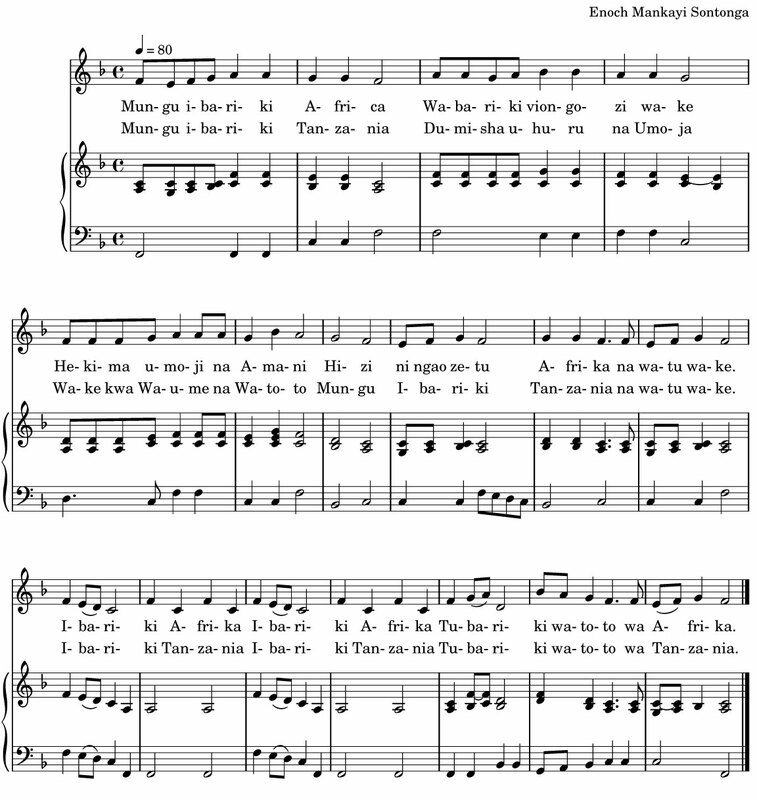 And then sometimes I, because of my interest, not so much because of my interest in Shakespeare, but in Swahili. 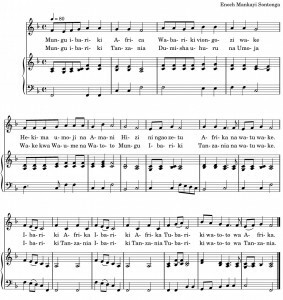 I have translated some bits of Shakespeare into Swahili because of my effort to learn Swahili rather than to translate Shakespeare. The East African and other media outlets have been reporting on the ambitious new investment plans being drawn up which should fairly soon see a dramatic improvement in production of energy – and hopefully an end to the energy crisis. In what African Report described as the largest ever single Chinese investment in Tanzania, an agreement worth $3 billion (about TShs 4.8 trillion) has been signed to develop the Mchuchuma coal and Liganga iron ore projects (The Citizen). The NDC will hold a 20% stake with the Chinese firm holding the remaining 80%. The projects will be implemented in two phases – the first phase will entail laying the groundwork at Mchuchuma and eventual mining of coal to be used in generating electricity, while the second phase will involve exploration and extraction of iron ore from Liganga. Symbion is set to supply 205 MW to the national power grid in support of the government’s emergency power plan. Under the firm’s expansion plan, Symbion would import more than 205 MW of generating equipment, adding new power to the grid incrementally from October, and the full 205 MW capacity will be available to Tanesco by the end of the year (The Guardian). The country has borrowed $63.4 million from the Export Import Bank of Korea which will help to build a power transmission line which will link future sources of electricity in the south of Tanzania with the north of the country. Plans are being drawn up for a huge 2,100 MW new electricity plant at Stiegler’s Gorge in the Rufiji River Basin. It will be built using Brazilian technology and will be developed by Brazil’s Odebrecht company. A Norwegian power engineering company has signed an agreement for a 100 MW turnkey project at Ubungu (using natural gas) in Dar and another at Nyakato near Mwanza (using heavy fuel oil). Finance totalling $530 million is coming from HSBC in Norway to support 15% from the government. Power is due to be switched on by June 2012. Tanzania has also secured a $250 million dollar loan from a consortium of local and global financial institutions, including the Standard Bank of South Africa, to fund rural roads and production of electricity. Finally, Tanzania has signed production sharing agreements ($75 million) with two oil companies to explore for oil and gas at Lake Rukwa and Nyuni East Songo Songo. Rice farmers in the Ruaha River Basin have been blamed for the ongoing power crisis. The principal engineer at the Mtera Dam has claimed that uncontrolled rice farming is behind the decreased water flow into the dam. TMA predicted that several areas of the country could face serious disasters such as floods, soil erosion and major damage to the infrastructure and environment during the short rains (vuli) between October and December. Other areas, which would not suffer from the effects of flooding, are expected to be faced with food shortages and perhaps famine due to insufficient rainfall. TMA has for the first time not only published this information in a highly professional way, but has also made clear which areas are threatened and gone on to make recommendations to deal with them. 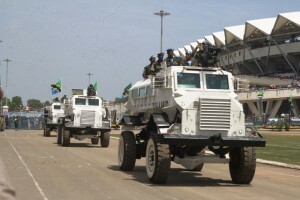 The government was advised to prepare itself thoroughly by designing strategies and creating new ways of protecting the economy of the country, by putting pressure on the Disasters Corps to ensure the preparation of sufficient and up-to-date supplies of all kinds, including air, road and waterborne transport, tents, blankets, medicines and rescue equipment. People complain that Tanzania has repeatedly suffered from such disasters but they come again and again because the government has not learned from them. The Tanesco monopoly on power production might be abolished, according to a report in Tanzania Daima. The government was said to have plans to amend current electricity laws to allow private companies to produce and supply. Minister of Finance Mustapha Mkulo said that “Currently we have power producers who remain with excess energy but they cannot sell it on to neighbouring communities. The new amendments will allow them mechanisms to sell it”. The dependence of energy supplies on rainfall was demonstrated once again by the following report (slightly abridged) from The Guardian of 7th October before the very heavy rains mentioned above. By early October, hydropower generation at the major dams, Mtera and Kidatu, had been drastically reduced as water levels dwindled even further, President Kikwete admitted. This was after the President was informed that the Kidatu plant, with a capacity to generate 200 megawatts, was producing only 40 MW and the Mtera plant was generating only 30 MW while it has the capacity to produce 80 MW. The Kihansi plant was producing 90 MW against 180 MW, Nyumba ya Mungu 3.5 MW against 8 MW and New Pangani 20 MW against 68 MW. The country was relying on electricity from Songas – generating 182 MW, Ubungo 100 MW, Tegeta 45 MW and Symbion 70 MW. 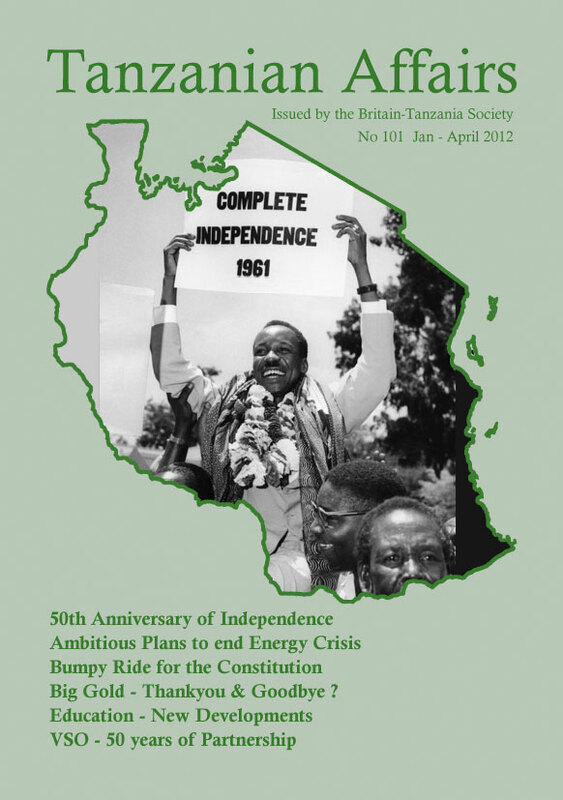 As Tanzanians celebrated fifty years of independence on 9th December 2011, they also engaged in an animated national debate over constitutional developments anticipated for 2012 (see TA No 99). This is not for the first time, nor are the basic issues unfamiliar: citizens are concerned to improve democratic structures, protect human rights and clarify the uneasy relationship between the mainland and Zanzibar. 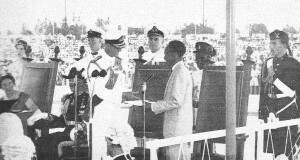 In 1961 the Trust Territory of Tanganyika, to most people’s surprise, overtook its neighbours Kenya and even Uganda in the race to independence but, following the pattern of previous British decolonisation, paradoxically became for the first time part of the dominions of HM Queen Elizabeth II, represented locally by Governor-General Turnbull! 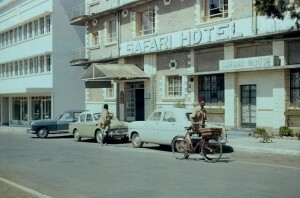 (Zambia broke the mould in 1964, when it passed overnight from Protectorate to independent Republic.) Tanganyika also joined the Commonwealth (Nyerere’s ultimatum on apartheid having earlier forced the withdrawal of South Africa, a founder member of the organisation). More surprises lay ahead. 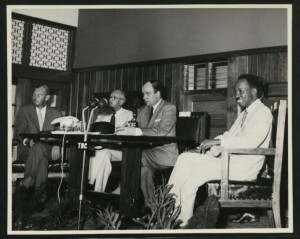 A month later, in a move unique among African nationalist leaders, Prime Minister Nyerere (still awaiting a biographer) resigned, replaced by his loyal deputy, the late Rashidi Kawawa. 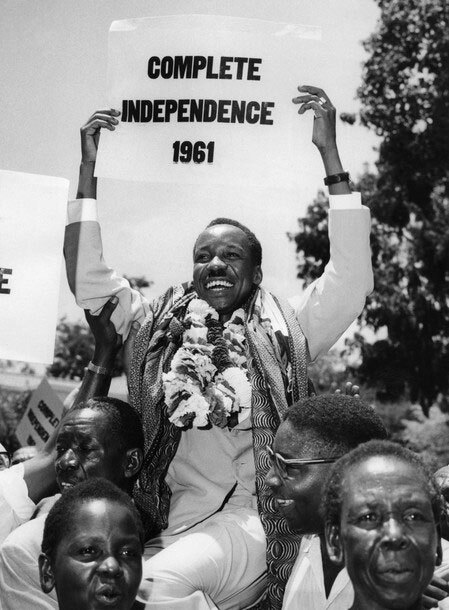 Nyerere spent much of 1962 as leader of the Tanganyika African National Union (TANU), which dominated Parliament and therefore controlled the Government, visiting local party branches to study and strengthen its democratic structures, based on ten-house cells at village level. Following constitutional amendments, Tanganyika became a Republic on the first anniversary of independence and Nyerere was installed as President, to lead the Government and country for more than 20 years. Zanzibar gained independence on 9th December 1963; a month later the Sultan and Constitution were overthrown by revolution and the Afro-Shirazi Party (ASP) assumed control. In April 1964 the Articles of Union between Tanganyika and Zanzibar were signed, establishing the United Republic which later adopted the name Tanzania. Thus began a unique and troublesome quasi-federal relationship, which continues to dog national politics. In 1965, in accordance with a TANU and Government decision and following a draft prepared by a Presidential Commission, the innovative one-party Constitution was adopted (see TA No 4). Redrafted in 1977, when TANU had become Chama Cha Mapinduzi (CCM), it lasted for over 25 years and still casts its shadow. It effectively subordinated national organs like the National Assembly to the primacy of Party organs. At elections voters chose between two TANU candidates selected by primary (party) elections, although in Presidential elections they voted for or against the single candidate nominated by TANU. Uniquely, Tanzania was a one-party state with two ruling parties (CCM on the mainland, ASP in Zanzibar), two Constitutions (Zanzibar adopted its own in 1979), two Presidents, two Parliaments and two governments. Tanzanian leaders had rejected the inclusion of a justiciable Bill of Rights in the independence Constitution, but to protect citizens the 1965 Constitution adopted a novel form of collegiate `Ombudsman’ – the Permanent Commission of Inquiry, to investigate citizens’ complaints of maladministration. The only other Ombudsman then in the Commonwealth – in New Zealand – provided the model for the law Tanzania adopted. Not until 1984 did Parliament respond to public political pressure and add the Bill of Rights, enforceable by the courts, to the Constitution. The celebrated Arusha Declaration 1967 had constitutional implications, especially in the Leadership Code, as did the elaborate but ill-fated project of decentralised government in the 1970s. 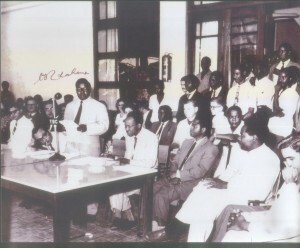 Major constitutional change followed the Nyalali Presidential Commission (1991) (TA 50). This reflected and focussed public opinion in favour of a multi-party system, which was established by constitutional amendments. However, loyalty to the former single party CCM has given it overwhelming Parliamentary majorities at successive General Elections, only slowly eroded by the several opposition parties. Few issues in Tanzania recently have attracted the attention given to the first stages of the constitutional review process now under way. Recent debates in parliament have attracted an unusual amount of interest and controversy. After months of consultation, meetings of legislative committees, and waiting, a Bill allowing for the establishment of a Constitutional Review Body was read for the first time in the National Assembly on 18th April 2011. Following many complaints it was then amended and presented again. In November, the government continued to solicit last minute consultations with constitutional experts from the University of Dar es Salaam and ex-prime ministers including Joseph Warioba and Salim Ahmed Salim. This last minute opposition by activists, academics and civil societies didn’t diminish the government’s determination to take the Bill to parliament in Dodoma for the second reading in November. The main object of the Bill was to set in motion the process of collecting people’s views and re-writing the country’s basic law. In the debates in parliament, MPs gathered amidst half a dozen media cameras. CCM MPs cheered wildly when anything was said to ridicule the opposition Chadema and NCCR-Mageuzi MPs. There was a walkout after Chadema’s Tundu Lissu MP had read an alternative draft Bill and rejected the government Bill. He objected that the Bill did not contain the various recommendations made by parliament when the first draft was rejected in April 2011. However both the government and Speaker refused to withdraw the Bill on the grounds that Tanzanians had been consulted and all legal processes had been followed. Chadema argued that the proposed Bill had given super powers to the President, including him being the only appointment authority of the constitutional commission, the qualifications of the constitutional commissioners, timescales for both debating the Bill and the proposed completion time. Eventually Chadema and NCCR-Mageuzi MPs boycotted the session by walking out prompting wild boos and cheers from CCM MPs (Mwananchi). No volume of cheering CCM MPs could drown out the technical mistakes that afflicted the Bill but it was finally endorsed by parliamentarians on 17th November 2011. Retired Justice Khamis Msumi said that: ‘The terms of reference of the people who will draw up the constitution are the heart of the matter because they are the ones which lead the commission…the consequences of having bad terms will be the forming of a bad constitution’ – The Citizen. When the opposition parties and civil societies came out in protest, even after parliamentary approval, the sealed Bill had already become an Act. The Minister’s envelope resembled a Christmas party gift on Christmas Day. The Bill was immediately dispatched to the State House for President Kikwete to assent, as explained when all local newspapers featured the story on 19th November. At the last parliamentary debate arguments by both CCM and opposition MPs made MPs seem like a ‘grade-school talent pageant’. It is unfortunate that the few MPs from the opposition could not block the motion going through against the majority CCM MPs. The home audience following the debate through Star TV and TBC1 would have been baffled by what they saw – Mtanzania, Majira and The Citizen reported on 15th November that ‘the road to the new constitution will be very bumpy’. Immediately after walking out, MPs from Chadema and NCCR-Mageuzi indicated that they no longer wanted to participate in the debate and the passing of the Bill, but preferred to speak directly to Tanzanians nationwide. The Guardian reported this on 16th Nov, but the Police immediately banned all political rallies. Earlier Chadema had requested to meet President Kikwete to discuss the Act. 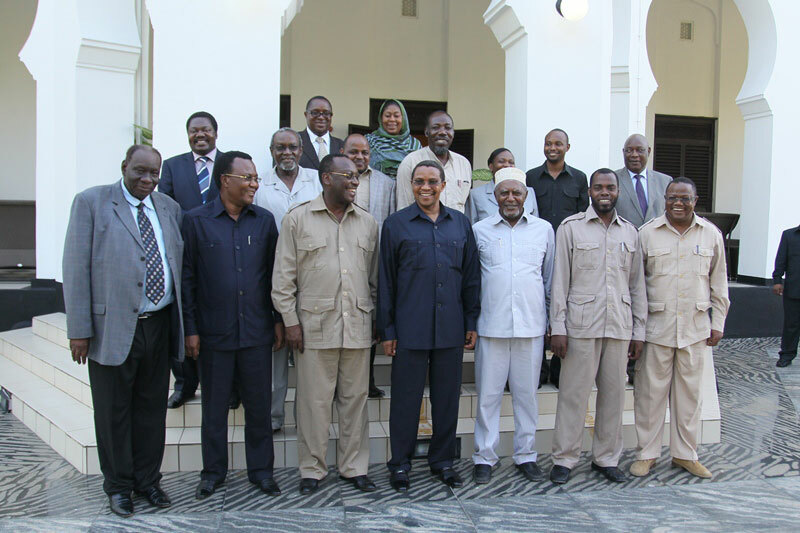 Chadema claimed that the President had been misinformed of their party’s views. The two met in talks described as fruitful and apparently agreed that there was a need for the government and other stakeholders to hold constant meetings and consultations, for the purpose of soliciting a national consensus. But government believed that the bill was perfect and the day after the President met Chadema he signed the Constitution Bill. The President made it clear that he would continue to receive views from stakeholders on how to best to improve the situation. Chadema then indicated that they would be boycotting the entire process of constitutional review, according to The Citizen on 30th November. For the huge majority of people abroad and in Tanzania it appeared that Chadema had not been much involved in deciding the contents of the Bill. The Constitutional Review Act 2011 stipulates that ‘politicians including MPs, councillors, security organs, officers or anyone charged in court with offenses related to ethics and losing trust, will not be nominated to the Commission’ and that the Constitutional Assembly would comprise all union MPs, all members of the House of Representatives, ministers responsible for the constitution and justice from the Union and Zanzibar and Chief Justices from both sides of the Union. In addition, there will be 116 members who will be selected from NGOs, religious organisations, political parties, higher learning institutions and groups of people with special needs. The Bill stipulates in section 27 (1) that the Tanzania Electoral Commission in collaboration with the Zanzibar Electoral Commission would supervise a referendum to decide whether the country should have the new constitution or not. However, Tanzania Daima reported on 12th November that Zanzibaris wanted the new union constitution to recognise Zanzibar’s status as a country. It is currently ‘seen’ as one of the regions of the United Republic of Tanzania. There were threats of demonstrations to make their voices heard, Nipashe reported. If there is to be a moment of anxiety for Tanzanians it would probably be during this period until the review is completed. The government said it is very much committed to a ‘new’ or ‘lipsticked’ constitution. But, to fill time, the government has fulfilled its duty to present the Bill in parliament for debate. The constitution, to Tanzanians, is the mother of other laws that all Tanzanians need to adore, and they could do a lot of good with it for their future. When the new constitution is ready Tanzania will be brighter. However, the ‘lipsticked’ constitution will certainly be unfit for the forthcoming challenges in the ever-changing Tanzania, Zitto Kabwe an MP for Chadema, writes in his facebook. Frederick Longino is a PhD student at York University studying the Interplay between Childrens Welfare and African Pentecostal Belief and Practice. 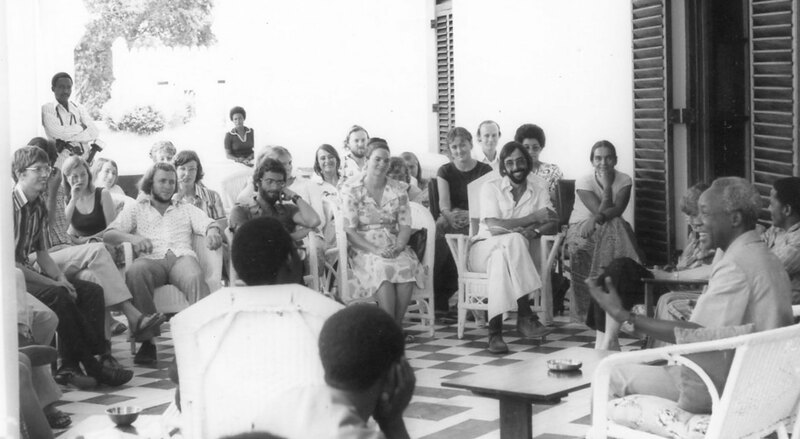 Earlier he worked on Good Governance in the President’s Office in Dar es Salaam. The Igunga district in Tabora Region might have become prominent in the history of Tanzania if, in the recent by-election there, Tanzania’s main opposition party Chadema had wrested the seat from the ruling CCM party. Both parties made tremendous efforts to win in some of the most active political campaigning Tanzania has ever seen. But Chadema lost and Igunga will now presumably return to its previous political obscurity. Former President of Tanzania Benjamin Mkapa was chosen by CCM to lead its campaign. In his opening speech he slammed the opposition parties for trying to persuade the public that CCM had done nothing since independence. He said that during his term in office he worked closely with the existing Igunga MP, Rostam Aziz, (a prominent figure in the CCM leadership) to bring development to the area. “Such cooperation had made Igunga one of the most exemplary districts in Tanzania in terms of social development” he said. The ruling CCM won the by-election by a narrow margin over the opposition party. Dr Peter Kafumu of CCM got 26,484 votes while Chadema’s Peter Kashindye got 23,260. 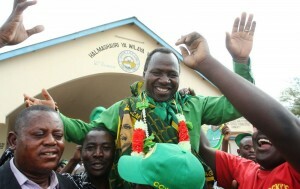 Leopold Mahona from the Civic United Front (CUF), who was earlier considered a threat to CCM although the party’s main strength is in Zanzibar, was far behind with only 2,104 votes – Majira. 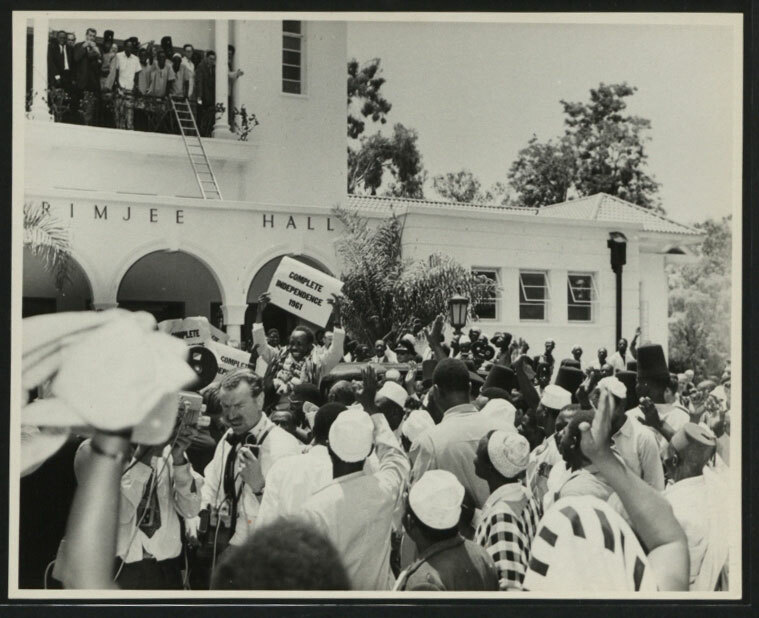 – the CUF candidate exchanged blows with Field Force Police after he was forced down from a podium. The police discovered that CUF had organized a meeting in an area already designated for Chadema. – former President Benjamin Mkapa asked voters to choose CCM and not ‘childish’ political parties – Mwananchi. – all parties fielded many of their top people including Chadema chairman Freeman Mbowe, Secretary General Dr. Wilbroad Slaa and youthful and charismatic MPs like Zitto Kabwe, Joseph Mbilinyi, Halima Mdee and John Mnyika. – the media were there in strength. One journalist wrote how a CCM leader had been found in bed with another man’s wife but had escaped being beaten (Tanzania Daima). Later, CCM was reported to be buying up all newspapers in Igunga to bury the scandal – Mtanzania. – Chadema supporters temporarily arrested the Igunga District Commissioner, who was said to be addressing an ‘illegal party meeting’ and the police then arrested two Chadema MPs said to have been involved. The answer to this question (CCM had to defeat seven other candidates) was given by Ray Naluyaga in the Citizen. He summed it up as CCM’s clear message delivery, a well-coordinated party network, its campaign strategies and its long experience in local politics. Admission by CCM that the national cake was small and that it must prioritise on what it does with it, made people understand why Igunga lacked bridges and roads, he explained. While Chadema enjoys immense support among the youth, CCM has women as permanent voters. CCM’s decision to use Rostam Aziz at its opening ceremony (after he had resigned from the party) restored the lost confidence among some voters who had started to see it as a party marred by internal conflicts. As for Chadema, he said it failed to give its candidate enough time to campaign. At the first rally party chairman Freeman Mbowe spent most of the time faulting President Kikwete, a thing that was not a priority for Igunga voters. The Chadema candidate was given only three minutes, though most people wanted to hear from the person seeking to be their MP. At other villages the candidate spoke for only five minutes. Chadema’s defeat was also blamed on the party’s failure to localise its campaign. Chadema used people from outside Igunga such as its MPs and other party officials while CCM relied heavily on locals. Wherever CCM held a rally, people close to Dr Kafumu, who were Igungans and spoke the local dialect, remained behind and chatted with the people face to face about their candidate and the party. This is something that Chadema did not do. On 20th October 2011 the Presidents of Tanzania and Uganda, as distinguished alumni, officiated when the University of Dar es Salaam celebrated its Golden Jubilee. The University College established on 1st July 1961 with one Faculty (Law), three teachers and just 14 students has grown into the University which now has several campuses, over 1,000 teachers and more than 15,000 students. 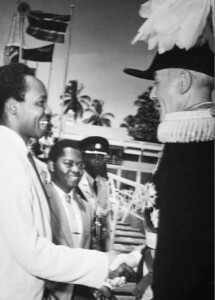 One of the earliest achievements of the new Government led by Chief Minister Nyerere, the college was (like Makerere University College in Kampala) ‘in special relationship’ with the University of London, awarding London degrees but teaching an appropriate local syllabus. 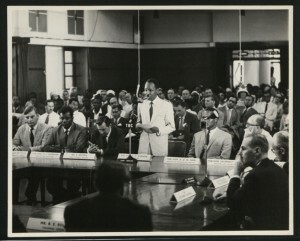 In its first session the tiny college had a Principal, Professor Cran Pratt from Canada (who had taught at Makerere), a Registrar/Secretary, Jock Snaith (former DC Arusha), a Librarian (Harold Holdsworth) and a Law Faculty with three Oxford graduates (Professor A.B. Weston from Australia via Canada, William Twining, previously lecturing at the University of Khartoum, and Patrick McAuslan, who had West African experience) and 14 students, from Uganda and Kenya as well as Tanganyika, pioneers of legal education which colonial governments had neglected. This small team built a solid foundation for the Law School and University, developing an extensive library, attracting international visitors and establishing a strong tradition of local teaching and research. 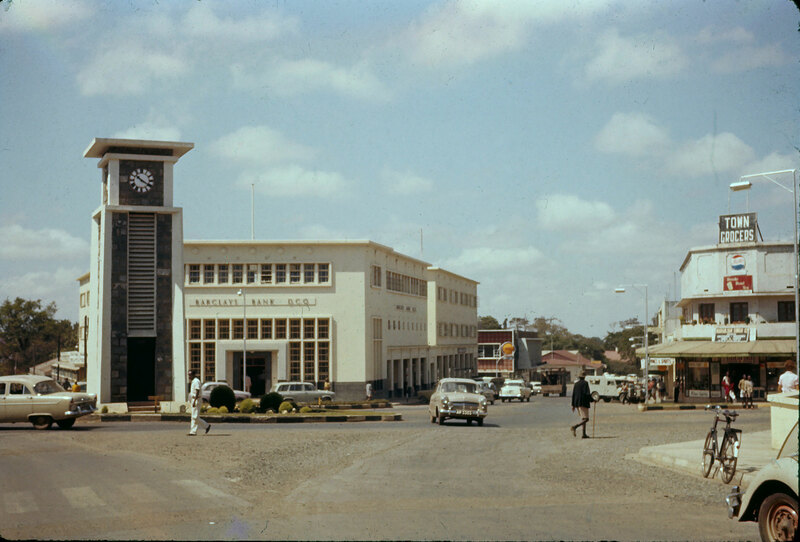 TANU, the ruling party, had just completed a new building on Mnazi Moja as its headquarters but lent this to accommodate the college until in 1964, after a rapid building programme, the college became multidisciplinary and moved into its first fine buildings on `The Hill’ at Ubungo. 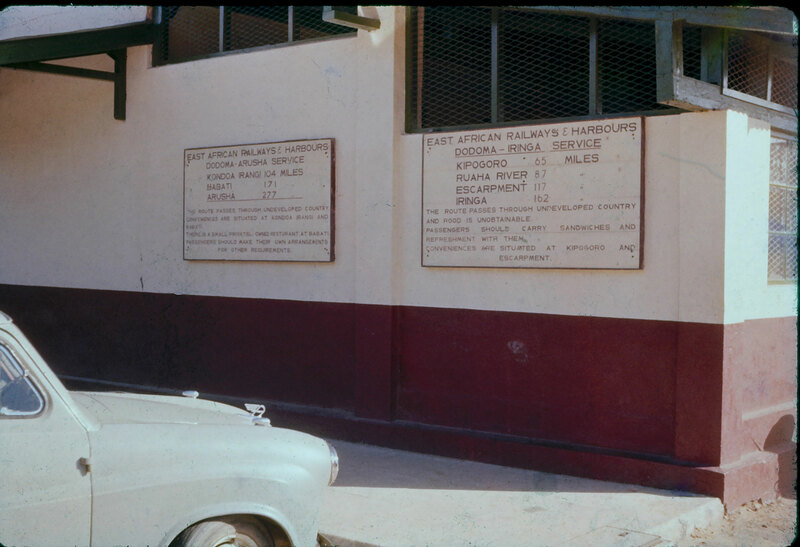 On 1st July 1963 the University of East Africa came into being, composed of the University College, Makerere and Nairobi University College. When in 1964 President Nyerere presided, as Chancellor of the University, at the first Graduation Ceremony, held in the open air at the college, he conferred London LL.B. degrees on those first 14 graduates, and also an honorary degree of the new University on Dr Louis Leakey, celebrated for his discovery of Zinjanthropus in the Olduvai Gorge. 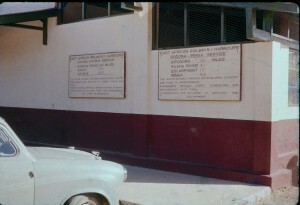 The college was transformed into the University of Dar es Salaam on 1st July 1970.